What is BYOD and Why do we use it? Supports TROY SCHOOL DISTRICT Cornerstones: Relationships, Responsibility & Ownership, Authentic Learning, and Innovation. You will need to log into Papercut with your network login and password. Step 1: Log into Papercut by clicking the button above. Step 2: Make sure your print quota is not Total Pages: 0. If quota is 0, see your media specialist. Step 3: Click Web Print from the side menu, then click Submit a Job. Step 4: Select the printer from the list or Find another student printer. Click Print Options button in lower right corner. 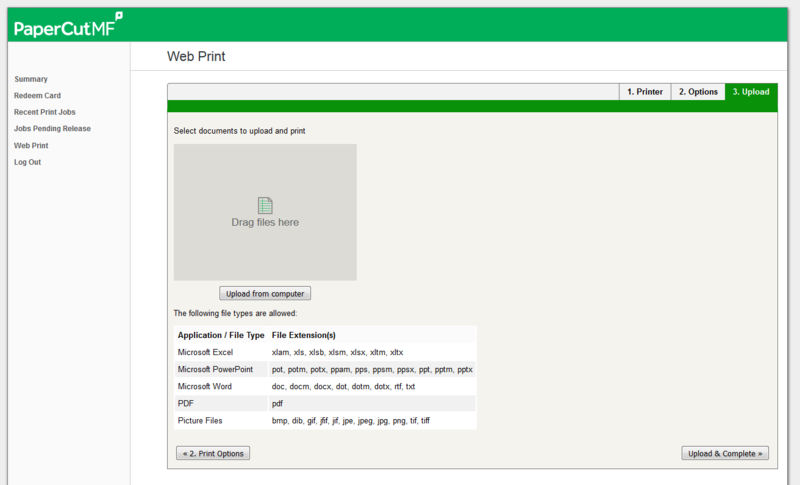 Step 5: Select how quantity to print and click upload button in lower right. Step 6: Upload your image, then click the Upload and Continue button. what type of device can my child bring to school? Just about any laptop or netbook is acceptable and will work on our network. Laptops need to have Windows 7 or later, Mac OS X 10.6 or newer operating system with a working web browser. Windows based, Apple, or netbook operating systems should work without issue. iPads & Android tablets will work on the network, as well. All devices will need to be wireless enabled and should have a screen size of 9.5” (10” class) or larger. Please remember that the use of these devices, as with any personally owned device, is strictly up to the teacher. All devices must have wireless enabled. Windows XP, Mac OS X 10.6 or newer (if applicable). A keyboarded device with a 9.5” or larger screen. While mobile devices are great for researching, planning, and collaborating, they have their limitations in creating new products. Laptops and netbooks allow you to be more productive in creating documents, movies, or digital media. Protective sleeves or cases will provide more protection. Headphones or earbuds are advised. Protect your device with up-to-date Anti-virus and Internet Security Suite software. Not every child will have their own device. The District will provide access to the internet via classroom computers and/or a limited number of mobile devices. Students may collaborate with another student as appropriate. Additionally, a rental program available for those that qualify. how can i improve my child's byod experience and keep them safe online? Understand your essential partnership in helping your child learn how to exhibit self-control and respect, make ethical choices, and be accountable for their actions. Carefully read and review the Responsible Use Agreement and the TSD BYOD Policy. Be sure your child’s device is in proper working order and is fully charged daily. Students should be made aware that the school is not responsible to provide an opportunity or the necessary power to charge their device during the school day. 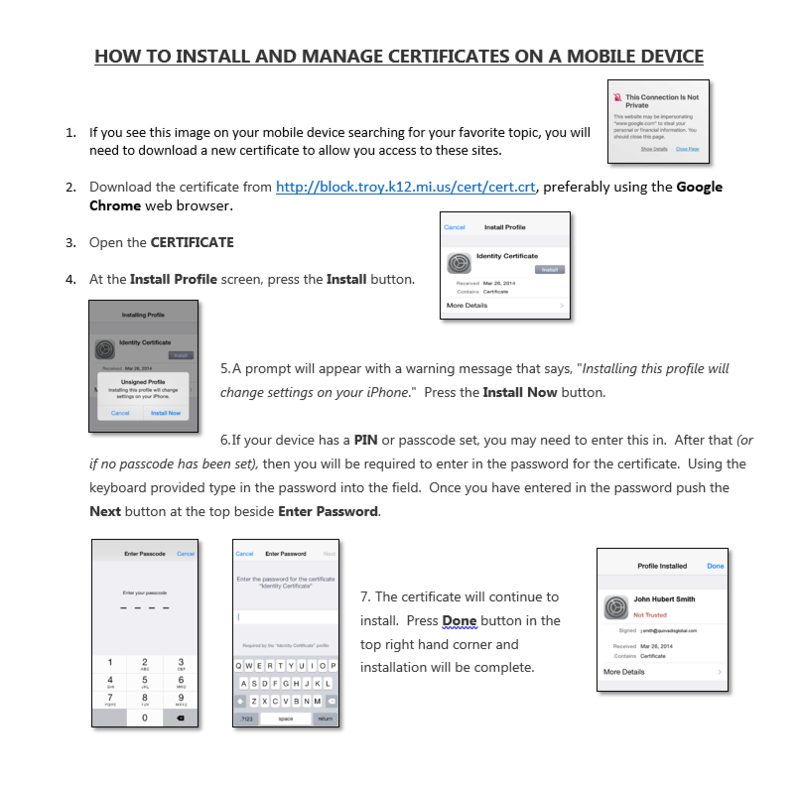 Monitor your child’s usage of their mobile devices. Set and maintain rules and boundaries for your child to stay safe on the internet. Your child’s best online protection is you. By talking to them about potential online dangers and monitoring their computer use, you’ll help them navigate the Internet safely. Use Antivirus and Internet Security software on all devices in your home. Make good password choices and teach them never to share those with others. Talk to your kids about avoiding cybercrime. Teach your children not to provide personal information including names, addresses, social security numbers, etc. out over the internet. Help them maintain and protect their online reputation. If they don’t want a parent or grandparent to see it or hear it, it shouldn’t be online. The Children’s Online Privacy Protection Act (COPPA), a federal law, was created to help protect kids online. It’s designed to keep anyone from obtaining a child’s personal information without a parent knowing about it and agreeing to it first. To facilitate instruction and practice internet safety, TSD’s internet connection is protected by an internet content filter. Students should only use the tsdusers WiFi internet connection with their BYOD device while on any TSD property. what programs will my child need to download on their device? All Students have 5 Microsoft Office 2016 Licenses to download and Outlook email address. Outlook @troyschools.org Email - Unlimited email storage and search tools that help you find information fast. OneDrive – Save, share and access documents anywhere. Collaborate in real-time with your group or with your whole school. Microsoft Office - Work together to keep related documents, web content and other information in one place, on one site. Includes access to Word, Excel, Publisher, Access and PowerPoint. Schoology – Students can turn in homework, access grades and collaborate with their teacher and other students. is there tech support at school if my child has trouble with their device? ​What about security, theft or damage? Devices are the sole responsibility of the student. TROY SCHOOL DISTRICT accepts no responsibility for the security or safety of the device. Students are responsible for the security of their device. Teachers and other staff will not store or hold onto devices. District IT staff or teachers will not support, repair or troubleshoot student devices. We recommend purchasing private insurance for the device your child brings to school. Theft or vandalism of any kind should be reported immediately to a campus administrator, so he/she can take the appropriate steps. How will my child connect to the Internet at school? Students will access the internet through the tsdusers (or tsdguest) wireless network. This network will provide filtered internet access as well as access to some other District systems and resources. what are the responsibility guidelines for my child regarding their device? ​Students contribute to a quality learning experience by coming to class every day with a positive attitude, personal integrity, and a commitment to making good choices. Students are expected to use the technology ethically, respect the privacy and work of others, and generally follow established rules for safety and security. The student is responsible for the condition of any personal device used for BYOD including updates, antivirus software and any repairs. Personal devices should be brought to school fully charged and should be capable of lasting a full school day without recharging. The student is fully responsible, at all times, for personal devices brought to school. Troy School District is not liable for any loss, damage, or theft of personally owned devices. No device, personal or otherwise, may be used to record, store, or transmit any type of image, sound or video from Troy School District, except for approved projects and with the express permission of the teacher. Student AUP and other responsibility references. I have my laptop with me in class. How do I get on the Internet now? ​Answer: Most laptops or other personal devices (smart phones), will detect a wireless connection when you are near one. Most of the time your device will ask you if you would like to join the network. When prompted, choose tsdusers or (tsdguest) from the list. Once you choose this network, you will login with your school username and password. My laptop is not prompting me to choose a wireless network. Is there another way to connect? Answer: In the settings menu of your device, there is usually an icon for a network, go to this icon and choose the tsdusers or (tsdguest) from the list or prompt your computer to look for wireless networks in range. Always consult your tool’s owner’s manual for exact directions for accessing a wireless network. I just can’t get my laptop to connect to the network. Can I get some help from someone? Answer: Please check with your teacher first and then see your building computer tech. Please know, however, it is not the responsibility of your teachers or other TSD staff to troubleshoot individual devices during the school day. Check your owner’s manual for issues concerning connectivity. I brought my device. to school to use, but my teacher said I couldn’t use it in her classroom. Can I still use it? Answer: The teacher in the classroom has the final say on procedures in the classroom. If he or she asks you not to use your technology tool, then you must follow those directions. Access is only available, not guaranteed, in the classroom. BYOD does not mean technology is used every hour of every day. Technology is simply another tool in a teacher's repertoire of instructional strategies. They will choose the most appropriate tool needed for that particular day/lesson. My child is bringing his device to school for instructional purposes. Will he have access to things he normally does with district equipment? Answer: Your child will have access to any of the web based software high school campuses currently use. Software may run differently on different devices for varying reasons. You should consult your owner’s manual for software limitations (e.g. iPads cannot run software requiring Flash Player). As a parent, am I required to add additional software (virus protection, filter, tracking device etc.) to my child’s technology tool? Answer: Currently, we are not requiring any additional software for school use. However, Virus protection and Internet security software is strongly advised. A product called Absolute Software can be installed on the device to track the location in case of theft. While on the TSD network, students will be monitored through the district’s filter, so there is no need for additional filtering software. What are the classroom rules for using student owned devices including phones? Answer: Teachers make the final decision for any tools used in the classroom; student owned equipment would be no different. It will be up to the individual teachers to communicate their expectations to parents and students. Contact your child’s teachers or administration for his/her expectations. Will my child have access to communication tools like email or message boards while on the TSD network? Answer: Yes. All high school students have user accounts for Microsoft, including Outlook Email and Schoology.